The founder of Heal the City, Alan Keister, M.D., realized the desperate need for health care witnessed on medical mission trips to Central America was not exclusive to third-world countries but was equally pervasive in neighborhoods within Amarillo. Dr. Keister began by offering free health screenings at various schools in Amarillo, and the response at San Jacinto Elementary was notable, with over 500 people being seen in two hours. The overwhelming response in the San Jacinto community demonstrated members of the community were suffering a drastic lack of access to healthcare and were primarily using the only source of care available to them at the time: the emergency room. 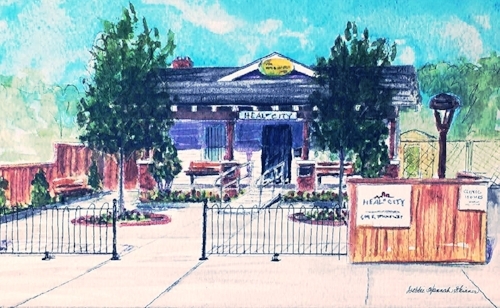 Thus, the vision of opening a free medical clinic in the San Jacinto neighborhood was born. The information results in a partnership with Generation Next Church to host a free medical clinic once a week addressing urgent care needs. On September 8, 2014 - Heal the City Free Clinic opened, utilizing a 1,400 square-foot house with four small exam rooms. In the house, HTC saw an average of 80 patients on a Monday night clinic. Heal the City continues to grow, adding additional clinic times, including hours for lab review appointments on Thursdays and a Women’s Night once a month, which provides free cervical and breast cancer screenings. Heal the City treats over 5,400 patients in 2016, three women are diagnosed with breast cancer and received treatment after being seen at Women’s Night, and over 1,500 immunizations are given to children. After its first full year in existence, Heal the City sees over 4,000 patients due to the overwhelming response from the community members in need and the generous support of numerous medical partners, donors, and volunteers. Heal the City is essentially gifted the old Mid-Town YMCA building at 609 S. Carolina, contributing approximately $55,000 for the 20,000 square-foot building. After it became apparent that some patients did not fit into any existing resources, Heal the City begins to plan a chronic care program to address this select group of patients’ medical needs. The chronic care program, Shalom, began October 2017. This year HTC treated 7,000 patients.